نیستانی, ابوالفضل, قادر, سرمد, محب الحجه, علیرضا. (1396). کاربست داده‌گواری در مدل WRF برای شبیه‌سازی بارش ناشی از یک سامانه همدیدی در غرب ایران. 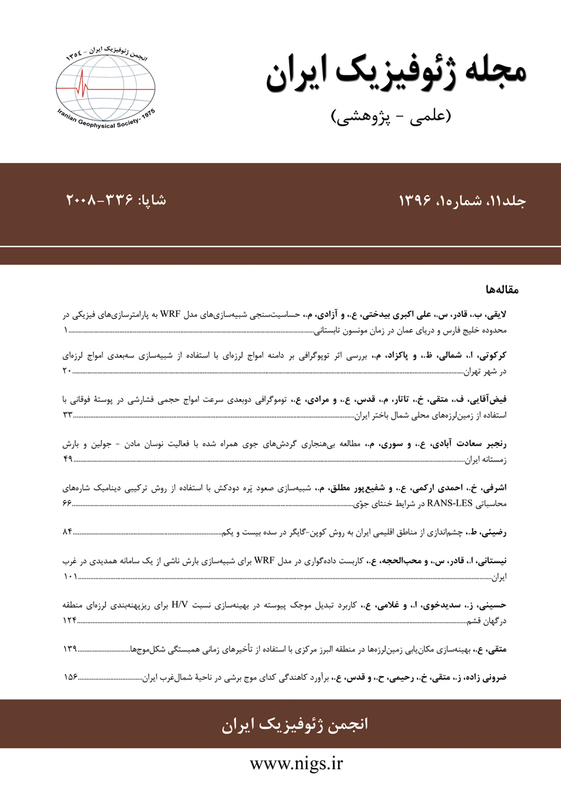 مجله ژئوفیزیک ایران, 11(1), 101-123. ابوالفضل نیستانی; سرمد قادر; علیرضا محب الحجه. "کاربست داده‌گواری در مدل WRF برای شبیه‌سازی بارش ناشی از یک سامانه همدیدی در غرب ایران". مجله ژئوفیزیک ایران, 11, 1, 1396, 101-123. نیستانی, ابوالفضل, قادر, سرمد, محب الحجه, علیرضا. (1396). 'کاربست داده‌گواری در مدل WRF برای شبیه‌سازی بارش ناشی از یک سامانه همدیدی در غرب ایران', مجله ژئوفیزیک ایران, 11(1), pp. 101-123. نیستانی, ابوالفضل, قادر, سرمد, محب الحجه, علیرضا. کاربست داده‌گواری در مدل WRF برای شبیه‌سازی بارش ناشی از یک سامانه همدیدی در غرب ایران. مجله ژئوفیزیک ایران, 1396; 11(1): 101-123. استفاده از مدل‌های پیش‌بینی عددی وضع هوا برای پیش‌بینی عددی توزیع مکانی و زمانی بارش با تفکیک بالا توجه زیادی را به خود جلب کرده است. کاهش دقت پیش‌بینی‌ها عمدتاً وابسته به میزان خطا در شرایط اولیه و انتخاب نامناسب طرحواره های فیزیکی می­باشد. در این تحقیق تاثیر داده­گواری در بهبود پیش­بینی بارش در منطقه غرب ایران مورد بررسی قرار گرفته است. آزمایش­های داده­گواری مختلف با استفاده از روش داده­گواری وردشی سه­بعدی (3DVAR) با اجرای مدل پیشرفته تحقیقاتی و پیش­بینی وضع هوا WRF و کاربست بسته داده­گواری مدل طراحی شده است. یک مورد رخداد بارش سنگین ناشی از یک سامانه همدیدی قوی در منطقه غرب ایران به منظور بررسی تاثیر داده­گواری بر پیش­بینی بارش انتخاب گردید. شبیه­سازی­ها شامل اجراهای کنترلی با سه مجموعه داده شرایط اولیه از سه منبع مختلف و اجراهای داده­گواری با استفاده از میدان ­زمینه GFS همراه با مشاهدات سطحی اندازه­گیری شده در ایستگاه­های همدیدی سازمان هواشناسی ایران و مشاهدات مرکز NCEP می­باشد. استفاده از داده­های مشاهداتی برای اصلاح میدان زمینه، تاثیر قابل توجهی در شرایط اولیه دمای تراز 2 متر و مولفه­های باد مداری و نصف­النهاری تراز 10 متر نشان داد. برای مثال، در بعضی از مناطق شبیه­سازی، دما در میدان زمینه 3+ درجه سلسیوس دارای فروتخمین نسبت به تحلیل به دست آمده بوده است و میدان باد نیز در بعضی مناطق به میزان 3± متر بر ثانیه تصحیح شد. همچنین مقایسه نمودارهای پراکنش میدان ­زمینه و تحلیل نسبت به مشاهدات مؤید کاهش پراکندگی و کاهش خطا در تحلیل به­دست آمده از روش 3DVAR می­باشد. نتایج نشان داد که دقت پیش­بینی­ها بسته به نوع داده به­کار رفته در شرایط اولیه مدل و طرحواره­های فیزیکی انتخابی دارای تفاوت­های اساسی است. در تحلیل اریبی بارش در ایستگاه­های منتخب در غرب ایران، داده­گواری در یکی از پیکربندی­های فیزیکی با داده­های سطحی سازمان هواشناسی ایران باعث کاهش 73% در میزان اریبی پیش‌بینی بارش تجمعی 24 ساعته گردید و در پیش­بینی­های بارش تجمعی 48 ساعته تاثیر داده­گواری کاهش یافت. تحلیل همبستگی به منظور مقایسه الگوهای بارش پیش‌بینی شده و مشاهدات نشان داد که داده­گواری تاثیری مثبت ولی محدود دارد. همچنین بیشینه تاثیر داده­گواری بر الگوی همبستگی پیش­بینی­های بارش نسبت به حالت کنترلی حدود 8% به­دست آمد. Ever increasing attention is paid to numerical weather prediction (NWP) models with the purpose of providing high-resolution precipitation forecasts. In such applications, which are based on both the theoretical analysis and numerical experiments, the prediction accuracy is closely related to the errors in the initial conditions and in the physical parametrization schemes. In the present research, the potential of data assimilation in improving precipitation forecasts was investigated in a case study on an active weather system in the western regions of Iran. Various data assimilation experiments were designed by running the weather research and forecasting (WRF) model and its data assimilation package (WRF-DA). In each data assimilation experiment, we applied the three-dimensional variational data assimilation (3DVAR) method. A heavy rainfall event caused by a strong synoptic system in western Iran was selected in order to study the influence of data assimilation on precipitation forecast. So as to carry out this study, the initial atmospheric and lateral boundary conditions were taken from three data categories: NCEP global forecast system (GFS), real-time forecasts at 3-h intervals, which are gridded to horizontal resolutions of 1̊×1̊ and 0.5̊×0.5̊, NCEP FNL (Final) Operational Global Analysis data on 1̊×1̊ grids prepared operationally every six hours and ERA-Interim reanalysis dataset of ECMWF, gridded to horizontal resolution of approximately 80 km at 6-h intervals. Simulations were divided into control runs and data assimilation runs, with the former runs being based on three sets of data as initial conditions. The data assimilation runs were conducted utilizing GFS data as the background and two sets of obeservations, namely the surface observations of Iran Meteorological Organization (IRIMO) and the NCEP observations. The observation data showed a significant impact on the initial conditions of 2m temperature and 10m zonal and meridional wind components, such that in certain parts of the simulation domain, the background temperature was estimated to be up to +3C°relative to the analysis and the wind field was revised by up to ±3 meters per second in some areas. The comparison between the scatter plots of the background and observations relative to the analysis corroborates the fact that the scatter and errors were decreased after using 3DVAR. The findings indicated that the accuracy of forecasts depends directly on the type of data employed as initial conditions for WRF model and the physical parametrization schemes, hence the fact that the simulations demonstrate significant differences. The bias analysis of precipitation for stations with precipitation records in the west illustrated that the assimilation of IRIMO surface data in one of the physical configurations decreased the forecast bias to a minimum of 73% of the cumulative 24-hour precipitation forecast. The impact of data assimilation, on the other hand, decreased in the cumulative 48-hour precipitation forecasts. Correlation analysis of the forecasted precipitation patterns and the observed values demonstrated that data assimilation generates a higher correlation coeffcient, implying that it had a discernible, though limited, positive impact on the case examined. In addition, the maximum impact of data assimilation on the correlation between data assimilation runs and control runs for precipitation was approximately 8%. Specifying a precipitation threshold for quantitative precipitation forecasts (QPF), the binary analysis was done, while the proportion correct score (PC) of each threshold was employed in order to investigate the forecasts quality. In conclusion, using the skill score of binary analysis is not a proper method to compare forecasts quality in different experimental runs when the number of forecasts and observational stations are limited. ذاکری، ز.، آزادی، م. و قادر، س.، 1394، بررسی اثر داده­گواری داده­های ماهواره و ایستگاه­های دیدبانی بر روی پیش­بینی­های مدل WRF: کنفرانس ملی هواشناسی ایران، اردیبهشت 94، یزد. صفر، م.، احمدی گیوی، ف. و محب­الحجه، ع.، 1391، بررسی اثر گوارد داده­های رادار در مدل عددی ARPS در شبیه­سازی بارش حاصل از سامانه همدیدی 31 مارس 2009 در منطقه تهران: مجله ژئوفیزیک ایران، 6 (3)، 94-112. قادر، س.، یازجی، د. و شهبازی، ح.، 1394، پیش­بینی میدان باد و سایر میدان­های هواشناسی در محدوده شهر تهران با استفاده از یک سامانه همادی توسعه داده شده برای مدل WRF جهت استفاده در مدل­های آلودگی هوا: چهارمین همایش ملی مدیریت آلودگی هوا و صدا، دی 1394، تهران. Alapaty, K., Niyogi, D. S., Chen, F., Pyle, P., Chandrasekar, A., and Seaman, N., 2008, Development of the flux-adjusting surface data assimilation system for mesoscale models: Journal of Applied Meteorology and Climatology, 47, 2331–2350. Argueso, D., Hidalgo-Munoz, J. M., Gamiz-Fortis, S. R., Esteban-Parra, M. J., and Castro-Dıez, Y., 2012, High-resolution projections of mean and extreme precipitation over Spain using the WRF model (2070–2099 versus 1970–1999): Journal of Geophysical Research, 117(12), IOD: 10.129/2011JDO11399. Barker, D. M., Huang, W., Guo, Y. R., and Xiao, Q. N., 2004, A three dimensional (3DVAR) data assimilation system for use with MM5: Implementation and initial results: Monthly Weather Review, 132, 897–914. Blum, J., Le Dimet, F. X., and Navon, I. M., 2009, Data assimilation for geophysical fluids: in Handbook of Numerical Analysis. Edited by Temam, R. M., and Tribbia, J. J., Elsevier Science, 777 pp. Calvetti, L., and Pereira Filho, A. J., 2014, Ensemble hydrometeorological forecasts using WRF hourly QPF and top model for a middle watershed: Advances in Meteorology, 2014, 1–12. Cardoso, R. M., Soares, P. M. M., Miranda, P. M. A., and Belo-Pereira, M., 2013, WRF high resolution simulation of Iberian mean and extreme precipitation climate: International Journal of Climatology, 33, 2591–2608. Chambon, P., Zhang, S. Q., Hou, A. Y., Zupanski, M., and Cheung, S., 2013, Assessing the impact of pre-GPM microwave precipitation observations in the Goddard WRF ensemble data assimilation system: Quarterly Journal of the Royal Meteorological Society, 140, 1219–1235. Chen, M., Xie, P., and Co-authors, 2008, CPC unified gauge-based analysis of global daily precipiation: Western Pacific Geophysics Meeting, Cairns, Australia, 29 July – 1 August, 2008. Colle, B. A., and Mass, C. F., 2000, High-resolution observations and numerical simulations of easterly gap flow through the Strait of Juan de Fuca on 9–10 December 1995: Monthly Weather Review, 128, 2398–2422. Courtier, P., Andersson, E., Heckley, W., Pailleux, J., Vasiljevic, D., Hamrud, M., Hollingsworth, A., Rabier, F., and Fisher, M., 1998, The ECMWF implementation of three dimensional variational assimilation (3D-Var). I: Formulation: Quarterly Journal of the Royal Meteorological Society, 124, 1783–1807. Guo, Y. R., Kuo, Y. H., and Parsons, D., 2000, Four-dimensional variational data assimilation of heterogeneous mesoscale observations for a strong convective case: Monthly Weather Review, 128, 619–643. Ha, J., Lim, G., and Choi, S., 2014, Assimilation of GPS radio occultation refractivity data with WRF 3DVAR and its impact on the prediction of a heavy rainfall event: Journal of Applied Meteorology and Climatology, 53, 1381–1395. Hacker, J. P., and Rostkier-Edelstein, D., 2007, PBL state estimation with surface observations, a column model, and an ensemble filter: Monthly Weather Review, 135, 2958–2972. Inness, P., and Dorling, S., 2013, Operational Weather Forecasting: Wiley-Blackwell, 231 pp. Kalnay, E., 2003, Atmospheric Modeling, Data Assimilation and Predictability: Cambridge University Press, 341 pp. Liu, J., Bray, M., and Han, D., 2013, Exploring the effect of data assimilation by WRF-3DVar for numerical rainfall prediction with different types of storm events: Hydrological Processes, 27, 3627–3640. Lorenz, E. N., 1965, A study of the predictability of a 28-variable atmospheric model: Tellus, 17, 321–333. Lynch, P., 2011, The Emergence of Numerical Weather Prediction: Richardson's Dream: Cambridge University Press, 1st edition, 290 pp. Macpherson, B., 2001, Operational experience with assimilation of rainfall data in the Met Office mesoscale model: Meteorology and Atmospheric Physics, 76, 3–8. Mass, C. F., Ovens, D., Westrick, K., and Colle, B. A., 2002, Does increasing horizontal resolution produce more skillful forecasts: Bulletin American Meteorological Society, 83, 407–430. Michalakes, J., Chen, S., Dudhia, J., Hart, L., Klemp, J., Middlecoff, J. and Skamarock, W., 2001, Development of a next generation regional weather research and forecast model: Development in Teracomputing, Proceedings of the Ninth ECMWF Workshop on the Use of High Performance Computing in Meteorology, W. Zwieflhofer and N. Kreitz, Eds., World Scientific, 269–276. Parrish, D. F., and Derber, J. C., 1992, The National Meteorological Center’s spectral statistical interpolation analysis system: Monthly Weather Review, 120, 1747–1763. Ruggiero, F. H., Modica, G. D., and Lipton, A. E., 2000, Assimilation of satellite imagery data and surface observations to improve analysis of circulations forced by cloud shading contrasts: Monthly Weather Review, 128, 434–448. Sasaki, Y., 1958, An objective analysis based on the variational method: Journal of the Meteorological Society of Japan, 36, 1–12. Sasaki, Y., 1970, Some basic formalisms in numerical variational analysis: Monthly Weather Review, 98, 875–883. Seo, J. H., Lee, Y. H., and Kim, Y. H., 2014, Feature selection for very short-term heavy rainfall prediction using evolutionary computation: Advances in Meteorology, 2014, 1–15. Skamarock, W. C., Klemp, J. B., Dudhia, J., Gill, D. O., Barker, D. M., Wang, W. and Powers, J. G., 2005, A description of the advanced research WRF, Version 2: NCAR Tech, Note NCAR/TN-4681STR, 94 pp. Sokol, Z., and Rezacova, D., 2006, Assimilation of radar reflectivity into the LMCOSMO model with a high horizontal resolution: Meteorological Applications, 13, 317–330. Sokol, Z., 2011, Assimilation of extrapolated radar reflectivity into an NWP model and its impact on a precipitation forecast at high resolution: Atmospheric Research, 100, 201–212. Stensrud, D. J., Yussouf, N., Dowell, D. C., and Coniglio, M. C., 2009, Assimilating surface data into a mesoscale model ensemble: Cold pool analyses from spring 2007: Atmospheric Research, 93, 207–220. Stephan, K., Klink, S., and Schraff, C., 2008, Assimilation of radar derived rain rates into the convective-scale model COSMO-DE at DWD: Quarterly Journal of the Royal Meteorological Society, 134, 1315–1326. Wan, Q., and Xu, J., 2011, A numerical study of the rainstorm characteristics of the June 2005 flash flood with WRF/GSI data assimilation system over south-east China: Hydrological Processes, 25, 1327–1341. Wang W., Bruyère, C., Duda, M., Dudhia, J., Gill, D., Lin, H., Michalakes, J., Rizvi, S., Zhang, X., Beezley, J. D., Coen, J. L., and Mandel, J., 2014, User’s Guide for the Advanced Research WRF (ARW) Version 3.6: NCAR. Wang, H., Sun, J., Fan, S., and Huang, X. Y., 2013, Indirect assimilation of radar reflectivity with WRF 3D-var and its impact on prediction of four summertime convective events: Journal of Applied Meteorology and Climatology, 52, 889–902. Warner, T. T., Peterson, R. A., and Treadon, R. E., 1997, A tutorial on lateral boundary conditions as a basic and potentially serious limitation to regional weather prediction: Bulletin of the American Meteorological Society, 78, 2599–2617. Xiao, Q., and Sun, J., 2007, Multiple-radar data assimilation and short range quantitative precipitation forecasting of a squall line observed during IHOP 2002: Monthly Weather Review, 135, 3381–3404. Xiong, C. H., Zhang, L. F., Guan, J. P., Peng, J., and Zhang, B., 2013, Analysis and numerical study of a hybrid BGM-3DVAR data assimilation scheme using satellite radiance data for heavy rain forecasts: Journal of Hydrodynamics, 25, 430–439. Xu, J., Rugg, S., Byerle, L. and Liu, Z., 2009, Weather forecasts by the WRF-ARW model with the GSI data assimilation system in the complex terrain areas of southwest Asia: Weather and Forecasting, 24, 987–1008. Yesubabu, V., Venkata Srinivas, C., Langodan, S., and Hoteit, I., 2016, Predicting extreme rainfall events over Jeddah, Saudi Arabia: Impact of data assimilation with conventional and satellite observations: Quarterly Journal of the Royal Meteorological Society., 142, 327–348. Zhang, S. Q., Zupanski, M., Hou, A. Y., Lin, X., and Cheung, S. H., 2013, Assimilation of precipitation-affected radiances in a cloud resolving WRF ensemble data assimilation system: MonthlyWeather Review, 141, 754–772.